While Aikido has lofty aims of promoting peace and harmony, its internal behavioral norms are, in important ways, out of sync with the goal of establishing robust conflict-resolution practices in verbal or linguistic domains of action. This is especially evident where Aikido has been transplanted into cultures that tolerate verbal interpersonal conflict, and that support the development of verbal skills to manage and resolve conflicts. In such cultures this disconnect can lead to confusion and ineffectiveness when students seek to apply Aikido principles in their problem-solving and conflict-management behavior off the mat, especially with one another. As a martial art and the product of Japanese culture, Aikido promotes within its practice communities behavioral norms biased toward non-verbal conflict management and unilateral strategies for saving face both for one's self and for others. To bluntly challenge another, especially a superior, can be interpreted as disrespect. Yet, for example in the US, such strategies are often seen as evasive, duplicitous, and disingenuous (this does not mean people in the US do not act this way; I think they do despite perhaps a greater espoused tolerance for open verbal conflict). Acting according to these indirect strategies in the US often leads to increasing mistrust, as people grow to expect that the spoken message is a distortion or contradiction of the real message which remains unspoken. Specifically, I think that the culture of Aikido maintains norms of behavior that make it difficult to communicate assessments -- especially critical ones -- validly and authentically with other Aikido people, especially Aikidoka of higher rank or of other styles. While acting in ways that purportedly show respect for the art and for one's sempais and teachers, students are motivated unilaterally to do or say things aimed at saving themselves and others from embarrassment. In Aikido training we are taught that committed, unambiguous physical attacks are good, and that hesitant or uncommitted attacks are bad and even dangerous. Yet on the verbal level we do not practice this way with one another. Instead, we tend not to speak forthrightly what we are thinking if it means disagreeing with or challenging the position of another, especially if the other is a sempai on the mat. To complicate the picture further, there is ample reason to accept and follow the notion of keeping quiet and withholding assessments while on the mat, and concerning matters of training. Aikido is a difficult art for westerners to grasp both conceptually and physically. Humility is a virtue for students who wish to begin and continue learning, and usually withholding assessments in order to discuss issues discretely later with sempai or teachers can be a wise choice. 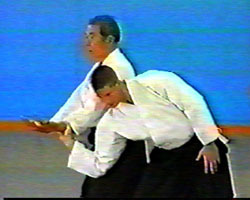 However, this on-the-mat virtue can become an off-the-mat liability when Aikidoka interact on matters not directly pertaining to aikido practice, such as making business arrangements for seminars, organizing member dojo associations, performing administrative duties, and doing tactical or strategic planning at dojo or association level. The norms of speaking and listening that we get used to practicing with one another on the mat tend to remain in use when we address one another off the mat, and so the circumspect, overly polite manners we properly practice in training become our default behavioral guides in other, verbal domains. A common result is that a stagnant status quo is upheld for want of authentic debate. Off the mat conversations may very well be better served by increasingly frank challenges among those who disagree or have concerns and positions incompatible with those of others in the conversation. Just as physical training requires committed, honest attacks; verbal exchanges on difficult issues are often well served by blunt, honest give and take. Indeed, for peace and harmony to be restored there must be some kind of open conflict to give people something to work with. I feel that this relationship between Aikido cultural norms and the way we actually behave with one another off the mat is an issue worth addressing out in the open. I believe that continuing to accept the apparent disconnect between our espoused Aiki values of resolving harmony out of honest physical aggression and our established off-the-mat verbal norms of avoiding direct conflict is a detriment to the art and an obstacle to its continued growth around the world. Moreover, for those Aikidoka who wish to transfer aikido principles into the realm of conflict resolution for non-martial artists in everyday life, to maintain linguistic practices that inhibit authentic verbal exchanges will become a tremendous obstacle to their success. When I was a karate student years ago it was all about violence and inflicting pain. This went both ways, and I often got taken down hard. But we were trying to learn to be dangerous, and showing no mercy in hand-to-hand training was part of the program. If you hurt someone, or if you got hurt there were no regrets, you just defended yourself. My teacher used to say, "things will either go well for you, or they will go badly; and there you are." This reminded me that any martial situation was uncertain, and that anyone could get lucky, which meant I had a chance against people more experienced than I. But it also implied that you could be unlucky and get your clock cleaned. One day near the end of class my teacher had told a bunch of us students to sit down on the mat. He seemed to want to talk to us a little before class was over. Most of us were orange, purple, and blue belts, which meant that we were roughly in the middle of the process of getting to black belt. In that dojo, the early belts up to purple were more focused on surfacing, even exulting in, aggression. At purple belt, though, our focus shifted to being more crafty and creative, and thinking sufficiently to match our response in a situation to the level of danger. This meant that we would get yelled at for employing a killing technique in a simulated encounter with a clumsy, annoying drunk. Our teacher would bellow, "are you going to just kill someone for being clumsy and stupid? No," he would explain, "you are probably going to make it safe without perhaps hurting him too badly, and this is a decision you are going to make in an instant with no possibility of undoing whatever action you take." I thought about how much common sense he was making, and was a little scared by how ready we seemed to be to kick and strike someone into a lifeless pulp at the slightest provocation. This attitude was especially interesting given that we knew even the most skilled could be defeated. As we gathered on the mat that night, all dripping sweat and feeling strong, our teacher said, "now I want to talk to you about the karate of no-touching." We all thought this was a kind of metaphor for something. No, he was talking about a kind of karate in which you never kicked, never punched, in fact, never touched anyone at all. He said it was the most effective form of martial arts, but one that you had to train for many years, even decades, to master. Someone asked him how there could be a karate in which there was no physical contact. Our teacher explained, "when I walk into a room I make it safe by my very presence there. It's not that I'm trying to intimidate; that just draws out people's fighting instincts. What I'm doing is being present in a way that people who might want to fight begin to feel that they don't, but don't really know why." He continued, "if someone does want to fight I might try to distract them with engaging talk about something they may be interested in. It means I have to be very perceptive, and notice something about what they are concerned with or care about. " "This is what the karate of no-touching is really about: listening so closely that you understand how to defuse a situation without ever making a fist." Long after that class, and after I'd abandoned karate for Aikido, this speech by my old teacher continues to echo in my mind. Now and then I am reminded that even in Aikido, the art of reconciliation, we are sometimes seduced by the desire to show what we know, especially in situations seemingly warranting a brutal intervention. At times like these, if I am tempted, I hope to recall what my old teacher said about the karate of no-touching. Or perhaps I might remember Terry Dobson's famous story of how an old man dealt with a drunk on a Tokyo train, depriving Dobson of the pleasure of subduing the drunk with Aikido. In a fascinating bit of synchronicity, just as I was about to enter this post I did a Technorati search on "Aikido" just for the heck of it. About the fifth item returned was Dobson's train story. A lot of consultants have made good money conducting weekend seminars at which they promise participants will learn new, highly effective moves for dealing with workplace conflict and complicated problems. Yet it seems that after a few weeks of evangelical enthusiasm back in the real world participants find themselves right back in the same old ineffective ruts they sought to escape by taking the weekend workshop. This failure is due to a misunderstanding of what it takes to learn new moves, especially when the new moves are aimed at displacing older, habitual ways of acting in response to typical life stresses and dilemmas. Moreover, there is an underlying assumption among westerners that further handicaps the process of learning to produce new actions. This is the belief that mere cognitive understanding of how we might put an obviously useful concept to use will actually enable us to perform the new action in a real-world setting. In short, the belief holds that cognitive understanding of how and why to move differently is all that is necessary to actually produce the new move. Students of Aikido, or any martial art, know that the path of learning new moves is one of regular physical practice, perhaps under the guidance of a qualified teacher. It may help in some ways for students to read books or view video clips to help them understand what they are learning on the mat. But to actually produce increasingly effective Aikido moves in real-time with a real opponent, years of repetitous physical practice to produce these moves are necessary. The reason that weekend seminars to learn new actions are largely unsuccesful is precisely because learning new moves takes extended physical practice, and that mere understanding of how and why to act, and maybe token practice, does not enable one effectively to produce the new move. Additionally, participants in programs to learn new behavior often don't realize that they are handicapped by the fact that they already have very well polished and practiced action programs to achieve certain, often conflicting, results in daily life. These existing action programs are automatic and reflexive, that is, we just perform them in situations without thinking about what to do. Often these existing programs are the source of our problems, and they are why we want to learn new moves in the first place; that is, to produce different and more effective results. An example of such an existing action program is: "own and control the playing field." Fueled by the value of "win, do not lose," this action strategy directs the behavior of micro-managers who cannot delegate anything and are constantly hovering over peoples' shoulders. A catch phrase of this strategy is, "if you want something done right, do it yourself." To displace the action programs that set this strategy in motion in real-world situations takes a great deal of new practice, both physical and abstract. And this practice takes time. Certainly more than a weekend. Our very impatience, driving us to want and expect instant results, is itself a reflexive habit that inhibits learning. Many of the fundamental physical practices involved in putting Aikido principles to use in daily life are designed to help people slow down the world and cultivate patience at times of stress. Decline to react immediately and stop, let your mind find your physical center and breathe into it a few times. Then act. Don't answer the phone on the first ring. When the phone rings make the ring tone a cue for you to find your center and breathe into it. Answer the phone on the third ring. If Aikido is to become a useful guide for how we can produce more effective results through our actions in the real-world, it will be important to develop new real-world-based learning practices and methods of teaching them to people that will actually help people produce new moves when they need to do so. In this segment I have argued that prolonged physical practice and patience are required to supplant existing action programs we already have polished for use in difficult situations. And I have claimed that weekend seminars and mere cognitive understanding of promising new moves is insufficient to set these ideas into motion. A question then arises: how to design and conduct learning practices to create the desired results. Do we list all the possible situations of conflict or difficulty people can get into and then work up scripts of new proposed behaviors? Is there another perhaps simpler way? Yes, I think so. It is based on the theory of self-correcting systems, or Cybernetics. Examining how the theory of Cybernetics could apply to training aimed at putting Aikido principles to use in everyday life will be the focus of later installments. When we perceive an attack, either physical or verbal, most of us choose either to fight or run away. In the case of a physical attack these options are straightforward; either fight or run away. In the realm of linguistic conflict, fighting or running away can manifest in more subtile ways, yet the results of such exchanges are often similar. The physical and linguistic tactics we use in fighting or running away can be seen as action programs in our behavioral repertoire that get triggered by certain situations of perceived aggression. Since over evolutionary time these two action programs have been adequate for social organization in our species, we have no further well-programmed strategies. The Aikido principles in play are, 1) get off the direct line of attack, and 2) blend with the attack in a way that you stay balanced and connected with your attacker. Staying connected with the attacker enables micro-adjustments based on direct experience of what the attacker is doing. Another interesting result of performing this technique physically is that you end up seeing the world from the same perspective as your adversary. While I have emphasized my belief that physical aikido techniques don't readily transfer as effectively developed tactics in the linguistic domain, I do feel that once the basic principles are experienced physically in training they may point to linguistic exemplars of these Aikido principles. These exemplars are verbal recipes that people can practice in speaking and listening. In a situation of perceived verbal aggression a great first response is to take a micro-second to locate the mind at the "one-point" in the body just below the navel and breathe deeply into that spot, relaxing the rest of the body. Once accomplished, this tactic opens the door to more choices. An easy next practice, that would embody the principle of stepping off-line and turning to face the attacker's direction, would be to repeat calmly the words spoken by the perceived adversary, but without an aggressive tone of voice. This buys time while not fighting yet keeping one in the game. These simple practices put together in action can become a kind of linguistic Tai No Henko, which after sufficient practice can become an additional action program in the behavioral quivver. Aikido teachers advise us not to look directly into the eyes of an opponent. O-Sensei cautioned that an opponent could steal your spirit if you lock into eye contact. Instead, we are told to expand the scope of vision from the center of the opponent's chest, so that we see everything, yet are focused on nothing in particular. These are two poles of vision. On the one hand we focus down to a fine point and lock onto a spot, eyes, sword, grab, striking hand, and so forth. On the other hand we widen the field of vision to include everything in a sort of dynamic tableaux. In everyday life we use a variety of perceptual collectors: vision, smell, touch, and listening. Listening in this case is more than just "hearing," it is the active assignment of meaning to what is heard. In everyday listening, just as in Aikido, we can telescope our perceptual focus down to a tiny point, or expand it to take in a wide spectrum of data. Mood can predispose our vision, and listening, to one or the other of these poles. For instance, a peevish or resentful mood can cause our attention to snag on a spoken word or phrase to the exclusion of all else. Then, if we react, it is often an angry response triggered by our narrowly focused listening, uninformed by any other data. Misunderstandings often result. At the other end, we may perceive an aggressive move by another, say, a snarky comment. At such a time, inhabiting a mood of generosity and compassion may widen our scope of vision and listening beyond the grab of the words, however hurtful. By relaxing and not focusing on the grab we are free to take in a wider range of data, which may include a reading of the mood of the other. At times like these wider vision and listening can enable us to have more choices than we might with a smaller perceptual vocus. Wider perception is an opportunity we create on purpose through cultivating an open, relaxed mood. It can reveal additional options, such as simply walking away and declining the invitation to fight. If we can widen, or narrow, our perceptual bandwidth by virtue of the mood we adopt, and if cultivating wider vision and listening can put us in touch with more choices for constructive behavior, then it makes sense to practice adopting physical moods in conflict situations that facilitate a wider perceptual bandwidth. This may not be something mortal humans can do every time, but if the practice of managing and shifting mood to enable wider "vision" results in one less stupid fight per month maybe it's worth the effort. Mood is the way we are as expressed by our bodies. It is the conscious or unconscious content of who we are being, what kind of presence we radiate as we go through the world. If we are gloomy in our bodies, this pales the spaces we pass through with a gloomy shadow. If we are radiating an enthusiastic, playful, or hopeful mood this can bouy the spirits of others nearby. In this way our bodies express the sum of our being in any moment. Sometimes we are aware of the mood we embody and how it may affect others, at other times, perhaps more often, we are not. In Aikido we practice adopting a martial spirit, which is a mood of confidence, focused awareness, relaxation, compassion, and ferocity. Students often start out inhabiting a meek and cautious mood, one expressed in their bodies by rigidity, tension, and reliance on strength to get out of trouble. Good Senseis customize their teaching for individuals to help them gradually embody a mood of martial spirit over time and training. For a martial arts teacher, intervening with a student about mood is very common. There are lots of different moods and attitudes in the dojo: enthusiasm and openness, focused ferocity, arrogance, fear, ruthlessness, compassion, to name a few. The teacher must know and be able to deal with all of these effectively for the good of the dojo community. Students do not only attend a school to learn martial arts techniques, they are also learning, from the teacher and from their own discovery, how to be better more effective people. Intervening about mood among peers or in off-the-mat situations is much more complex and difficult, even if the aim of the intervention is sincerely to help someone learn. Sometimes friends will accept advice to "get off it" or to shift out of a resentful mood, but often enough they will decline the advice and burrow even deeper into whatever mood we are counseling them to abandon. In work situations, where we are contracting to spend time and energy, ad hoc interventions on mood are even more complicated, difficult, and likely to backfire. In the dojo students give implicit permission to the Sensei to intervene with "the whole person," from physical abilities to personality traits, to attitudes and mood. But at work no such permission is routinely offered to managers or peers. In the workplace mood is not readily negotiable, only quanta of work done per time unit is fair game. A good part of the reason for this off-limits approach to dealing directly with peoples' mood at work is that there are no easy methods for intevening in a way that preserves dignity, nor are managers trained in any systematic techniques for conducting such interventions that lead reliably to effective resuts. These concerns are important to anyone interested in trying to apply Aikido principles in spoken communication to manage conflict and complex problem-solving conversation in the workplace. If we are going to design methods for training people to apply Aikido principles to off-the-mat and work-related breakdowns, it seems obvious that we will need to address the whole person, and this will include dealing with mood along with every other component in the process of speaking and listening. My body keeps slipping into resignation this morning. I keep pumping, trying to reinflate it with a patient hopefulness. Work in progress. I'm angry, bewildered, disappointed, and a little frightened for the future. I don't recognize my country anymore; it's become something alien, that I don't understand and cannot connect with. Cynicism becomes a more formidable enemy; it has so much now to work with. It is the worst kind of poison pill, on the one hand offering a kind of perverse comfort, on the other hand exterminating hope and killing off the future. Aikido will be good medicine. Practice. Today is Election Day. And because I'm feeling a little hopeful about the outcome, instead of harboring the cynical atitude I've often adopted over the period of the campaign, it seems like a good time to look at physical mood. The meaning of "mood" in this sense emerges from the observation that when we speak we communicate very often also with our bodies, posture, even facial expressions. This is how we pull off "sarcasm," by giving physical cues opposite to the meaning of the words we speak. Additionally, we often embody moods, like "wonderment" or "resignation," unconsciously and automatically in everyday life situations. These moods we adopt color the physical space we live in and communicate from, even when we are not consciously aware of it. So the total package of linguistic communication is a complex soup of words and physical cues flowing through a very broadband pipe, including much more information than the channel carrying our words alone. Because of this, it makes sense for designers of linguistic practices to mirror Aikido in speaking and listening encounters to explore ways of recognizing and dealing with the impact of physical mood on the overall exchange. I began learning about the importance of physical mood in communication while I was a part-time student of Richard Heckler, a consultant and Aikido teacher in Northern California. He declares, "your body is the life you lead." Additional details on mood are drawn from the work of Fernando Flores. We can identify a number of different moods that we and others adopt and live in as we confront the world. Some of them may rob us of power, such as "resignation" and it's clever cousin, "cynicism"; "resentment," and "fear." These moods kill off our motivation or ability to provide leadership, as we might want to do in difficult verbal situations. On the other side of the mood spectrum arise "confidence," "hopefulness," "wonder," and "compassion," to suggest a few. These moods tend to open up the future and enhance our ability to move powerfully as we would in doing Aikido. In Aikido we are inventing actions to deal with the entire physical situation. So if the attacker demonstrates a cold confidence we would probably do different Aikido than if the attacker was boiling over with rage. In Aikido we are trained to evaluate the mind of the attacker as it manifests through the attacker's physical energy and body. But it is the body that expresses everything, that projects the attacker's being into action. In order to design practices of speaking and listening that mirror Aikido principles it makes sense to deal with the whole person here too. That means practicing ourselves with different combinations of words and moods to deal with the words and moods (however unconscious) of others in difficult everyday life situations. A sticky methodological issue is how to intevene directly about another's mood when the other has not given us permission to do so. In a comment, Coleman Ridge observes that whatever we do to help put Aikido principles to use in daily life situations, for effective results, we ought to build new practices, and not hope for success by simply "intending" to do something different. He conjectures that these new practices would be rhetorical or linguistic, basically arising in the realm of speaking and listening. This is what I think too. An assumption I'm making is that practices aimed at producing new actions, different from our default programmed actions, will be most successful if we simulate training environments similar to the ones in which we actually want to move in new ways. What I mean is, if we want to verbally "blend" with a declared adversary at work, we would succeed best by designing and training with practices using linguistic "blends" staged or role-played in a workplace setting. This assumption is a corollary of my original suspicion: that on-the-mat training is insufficient to enable a robust ability to enact Aikido principles verbally in off-the-mat domains. I do not know whether these assumptions are that well founded, and I believe it would be a tremendous project for a doctoral student to explore these assumptions. I also have additional concerns about any proposed verbal learning practices. One of the most important of these concerns to me is, how to facilitate such learning while preserving the dignity of everyone in the loop. In the dojo this is easy. The students give the teacher complete discretion to guide them through whatever physical and attitudinal shifts they need to make to progress in the art. It is a given that the students are not themselves aware of what these shifts are nor how to make them. To put ourselves in the hands of a teacher to help us learn what we don't know we don't know requires a deep trust. Establishing this kind of trust in the more purely linguistic world of everyday life and especially work life is vastly more difficult and complicated than doing it in a dojo, where you can see the physical techniques you want to learn performed elegantly and expertly. There have been a few researchers in organizational behavior that I have grown to respect as possible resources for help in designing the kinds of practices that might help, and at the same time, satisfy the learner's right to informed consent to the nature and structure of the learning process design. This value of informed consent, I feel, is important in preserving the dignity of everyone involved. Some of the researchers I'm talking about are John Dewey, Kurt Lewin, and Chris Argyris. One basic practical guideline I'm drawing from these and other researchers is that it is not helpful to "trick" someone into learning something, no matter how beneficial such learning potentially may be to the student. Not only is it not helpful for creating learning, it actually inhibits learning by eroding the student's trust in the teacher or facilitator. I think many teachers limit their success by being in denial that their very methods are counterproductive to the results they claim to achieve.